This impressive dessert has a reputation of being temperamental just like the tricky macarons. Trust me, it is not. Not even close. It is quite simple. This light baked dessert is a treat to the eyes and your palette. 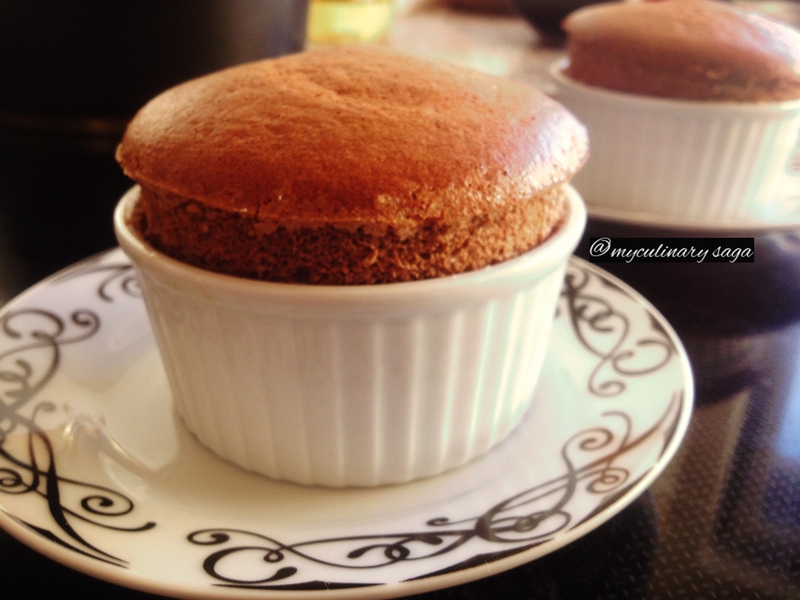 The soufflé gets it signature height with stiffly beaten egg whites. It can be served as a savoury main dish or as a dessert. Today I go with chocolate. Brush melted butter inside of ramekins and dust with caster sugar. Make sure ramekins are generously coated with sugar. Set aside. To make the Béchamel Sauce: Melt butter in a sauce pan and add flour and cook for 1 min on low heat. Add in hot milk and bring it to a boil over medium heat. Cook until thick stirring constantly. Remove from heat, add chocolate and stir until melted. Then separate the eggs and add in egg yolks all at once and vanilla extract and stir until combined. To make the French Meringue: Whisk egg whites until you get soft peaks. And gradually add in sugar while whisking. Whip until you have stiff peaks. Add about half of meringue to chocolate mixture and whisk until combined. Then pour the chocolate mixture into meringue and delicately fold until combined, turning the bowl. Be gentle here, you do not want to deflate your batter. Spoon the batter into the ramekins to the top. Then clean the rim with your thumb. This ensures that the soufflé will rise evenly. Bake at 180 C. for about 15 to 18 min, or until puffed and crusted on top. 😛 I wish you were here!